A: No. Barrie Ryusei Karate is a not-for-profit karate club, so we try to keep prices low. You don’t have to sign a contract, as you do in many professional clubs, which often commit you to a year of high fees, with penalties if you try to cancel early. Here, you can start and stop lessons whenever you feel like. Q: Besides the membership and annual fees you spell out, what other costs are involved? A: If you want a karate uniform, you can either buy your own or we can pick you up one. While costs of uniforms vary, a child should be able to get one for $30 to $40. Students should also buy their own mouth guards, for a few dollars, and have the option of buying sparring gloves ($20-$25; the club has some of its own, which students can use). If students attend special clinics or participate in tournaments, some reasonable costs will be charged. But these activities are optional. To test for a belt and certificate costs $25. 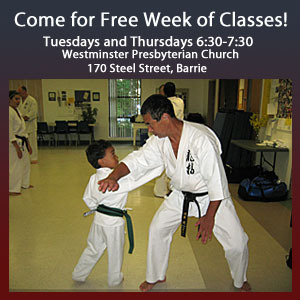 Barrie Ryusei Karate holds two gradings per year. Q: Can I take lessons with my child? A: Yes, of course. While we do have separate adult classes, a number of parents over the years have elected to do classes with their children. We welcome and encourage this situation. Adults who work out with their children can also stay for extra training after the lesson, if they choose. Q: How do I know your credentials are legitimate? A: Good question. The short answer is, you don’t. Martial arts are basically not licensed by government, so anybody can claim any kind of ranking or achievement. The instructor of Barrie Ryusei Karate-Do, Peter Giffen, has been a long-time member of the Karate Ontario and the National Karate Association, which are government-recognized provincial and national karate organizations. His teacher, Shane Y. Higashi, has been recognized by the NKA as one of the country’s karate pioneers. Peter himself was ranked a fifth degree black belt Chito-Ryu karate under Higashi-Sensei, and then was ranked a 6th degree black belt under Ken Sakamoto, who founded Ryusei Karate (a splinter style from Chito-Ryu) and is based in Kumamoto, Japan. Peter has maintained and grown his karate knowledge by taking special clinics and doing training throughout Canada, the United States and, especially Japan, where he trained under Tsuyoshi Chitose, the founder of Chito-Ryu, and many other senior Chito-Ryu instructors. He has trained continuously since 1969. While this may all sound good to you, lots of other instructors also claim solid pedigrees – a few of them undeserved. So at the end of the day, you take your chances.